New Delhi, Delhi, India/News Voir//– UC Browser, India’s leading mobile browser from UCWeb, Alibaba Digital Media and Entertainment Group, will host live streamed chats with legendary cricketers Virender Sehwag and Shahid Afridi during the highly anticipated Asia Cup 2018 cricket encounter between arch rivals India and Pakistan on September 19th at 9:30 pm and September 23rd at 7:00 pm, IST. The two former great cricketers will indulge in conversation and discuss about the never-ending excitement everybody holds for the Indo-Pak cricket clash. The arch rivalry between the two nations has always resulted in India v/s Pakistan cricket matches being billed as amongst the greatest sporting rivalries in the world. 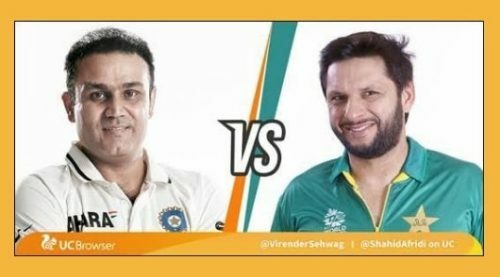 Virender Sehwag and Shahid Afridi, known as on field enemies and off field friends, will discuss and debate over a host of topics in relevance with the game and share their personal match experiences with cricket fans on UC. Cricket lovers can expect the two cricketers, known for their swashbuckling and aggressive on field performances during their playing days, to bring the same aggressive intent and passion on UC’s online platform. Also, they will be enjoying imitating each other with high spirits, trying tongue twisters and will speak in Punjabi and Pushto language and will recite some never heard dressing room secrets. In the live chat experience the former cricketers will claim to put their team up in every possible way. It is undoubtedly that Afridi will talk about India’s defeat at ICC Champions Trophy last year and stating how Kohli’s absence can impact India’s performance whereas Sehwag is expected to defend the honor of India team. These remarkable comments will add more spice to this never ending debate and enthrall fans with their expert opinions. UC is creating an opportunity for the fans all around the world to participate and be a part of this interesting live chat session. Anybody can send in their queries to the experts using the various hashtags as follows “#SehwagMeetsAfridi #IndiaVsPakistan #AsiaCup”. UCWeb Inc. (UCWeb), a business within Alibaba Digital Media and Entertainment Group, is a leading provider of mobile internet software and services. The international product portfolio of UCWeb includes UC Browser and UC News (content distribution platform), 9Apps (Android app store), and UC Ads (mobile marketing platform). UC Browser is one of the world’s top 3 mobile browsers (as per StatCounter). UC Browser has reached 430 million Monthly Active Users globally, while 9Apps has clocked over 250 million users. Additional information about UCWeb and its products can be found at www.ucweb.com.